The world's oceans are working overtime to help out with climate change - doing us a massive solid favor by absorbing the majority of excess carbon dioxide we blast into the atmosphere. But sadly, the oceans are also awash with millions of tons of discarded plastic. So no matter how willing the ocean is to help out, we're making it harder and harder for it to do the job. The latest samples of water taken from the eastern Pacific gyre - aka the Great Pacific Garbage Patch - contain miniscule plastic fibers. Their microscopic size - mere millimeters - has some nasty implications. Plastic Monofilament Raft. Photo: Dale Selvam - Algalita Marine Research Expedition, August 2014. These plastic strands create tiny rafts, floating as deep as 10 meters, and intercepting other plastic fragments and "marine snow." This snow is a vital part of the ocean's biological carbon pump. The pump begins at the ocean's surface, where carbon dioxide gets absorbed by photosynthesizing plankton. When the plankton dies and decomposes, it sinks like watery snowflakes, providing carbon and other goodies to deep ocean dwellers, or settling on the ocean floor. This pump - is one of the major mechanisms by which oceans sequester rising carbon dioxide levels. Meaning it's going to be all plankton on deck as the planet warms. But what if our throw-away culture's conspicuous consumption of plastic, destroys the ocean's ability to mitigate climate change? The alarm bells are sounding loud and clear over the folly of continuing to burn fossil fuels. But there is also a loud S.O.S coming from the sea. In 1997, Captain Charles Moore discovered the Great Pacific Garbage Patch. His scientific analysis showed plastic outweighed plankton biomass by 6:1 in 1999. 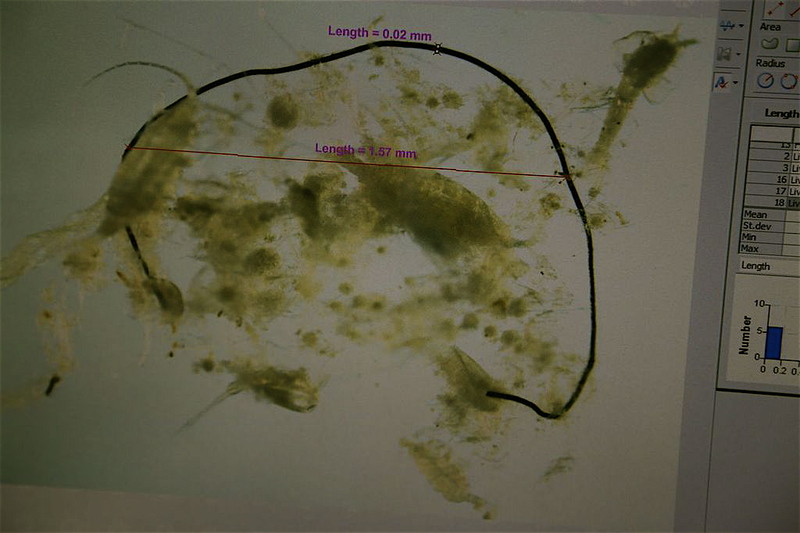 Ten years later the amount of plastic versus plankton was 36:1. This summer's expedition found plastic outweighing plankton more than 100 times. Captain Moore's Agalita Marine Research team also discovered the existence of the tiny plastic monofilament flotation devices. Captain Moore says the fibers most likely come from unraveling fishing gear and ropes - both of which are now predominantly made of plastic. While most of the plastic in the ocean starts out on land washing into the sea, a huge amount is being abandoned, lost, or dumped directly into oceans by the fisheries and aquaculture industries. Captain Charles Moore on a Plastic Island in the Pacific Ocean: Algalita Marine Research Expedition, August 2014. But what happens in the ocean can no longer stay in the ocean - take FADs (Fish Aggregation Devices) as a case in point. These are artificial - read PLASTIC - structures set by fisheries to create habitats for small fish, which in turn lure the big boys - tuna. Once a dirty little secret of fisheries, FADs are now a major concern. It's estimated there are between 47,000 -105,000 FADs drifting in our oceans - many are simply abandoned once their economic usefulness is realized. 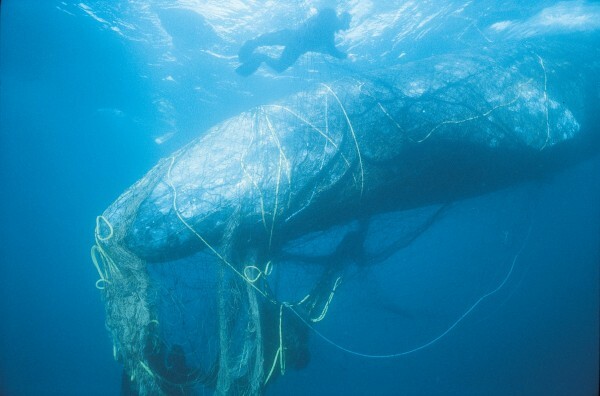 Sea mammals drown in intentionally set fishing nets every day. This accidental "by-catch" as it's euphemistically called is helping drive many species to extinction. Grey whale caught in a ghost net. Even U.S fisheries operating with fairly strict regulations annually trap 2 million tons of by-catch. With ghost nets, the carnage is repeated over and over again - sinking when heavy with dead marine life, but once it has decomposed, the nets float back up to the surface, and the grisly process is repeated. Because the bottom line with plastic is it doesn't biodegrade or go away. Unless successfully recycled - and only a paltry 9% of plastic gets recycled in the U.S - most of the plastic ever produced is still with us. In the presence of sunlight plastic photo-degrades - fragmenting into smaller and smaller pieces. There's ample opportunity to photo-degrade in oceans, which cover 71 percent of the Earth's surface. There are gyres to entrap the plastic, and currents to transport it thousands of miles to litter remote beaches on once pristine islands and atolls. In 2011 the European Union struck a deal - Fishing For Litter - whereby fisherman are paid to fish for plastic and bring it ashore for recycling: a two-fold win because it also relieves pressure on over-fished stocks. Not to mention, the Mediterranean Sea is one of the most plastic-polymer deluged pieces of water in the world. While this is exactly the sort of measure that might help restore the oceans, what about the jettisoned nets and ropes that have already photo-degraded into infinitesimal fibers? If plastic fragments this small interfere with something inherently simple but ultimately vital - the ocean's biological carbon pump - we may have another unintended environmental problem on our hands. Cheap energy and a so-called-convenience lifestyle are already creating an ecological catch-22 -- where our greatest ally in coping with the mess - the ocean - is straining to function properly. In 1869, environmental champion John Muir saw the interconnectedness of life like this, "When we try to pick out anything by itself we find that it is bound fast by a thousand invisible cords that cannot be broken, to everything else in the universe." It's estimated by 2050, yearly plastic production will quadruple to a staggering 100 million tons.